Is it really a bad thing to place an ad TV in front of the stairs? 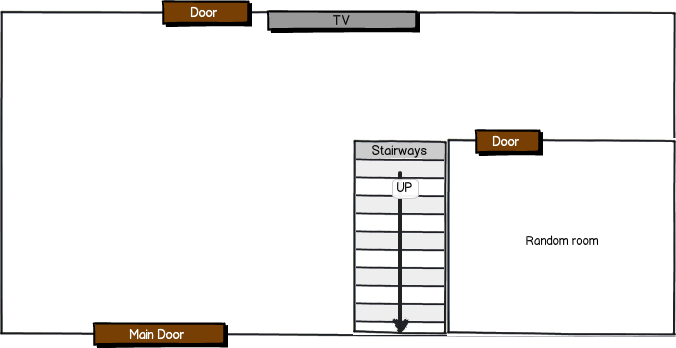 We have the following room arrangement with a plan on a 40 inch TV mounted on the wall. In this place people usually walk between the stairways and the main door, so I suggested to place the TV against the main door. Actually this is the only viable place because other wall spaces are occupied by windows, etc or simply not a place where people would notice the content on the TV. There would be ads and various info displayed in the monitor and one of my friend told me that we shouldn't place the TV against the stairways because people who came down on it can be distracted from the images and they would fall off. Is this really an existing problem? Do people tend to fall off from stairways because of visual distraction? Assuming you actually want people to view the content, that's one of the worst places in the room to place a TV display. You not only have a staircase with (presumably) two-way traffic, but also a blind hairpin turn where traffic coming in and out of the main doors rounds the corner to climb the stairs. Adding a visual distraction to this intersection is really not a good idea, even if (for the sake of argument) it's a monotonous reel of content. On conveyors (escalators and elevators) they are placed in locations where people are likely to be standing still and waiting, rather than getting in and out of the conveyor. In high-traffic areas (airports) effort is made to place displays in areas where there is some space for people to walk around crowds (e.g. travelers assembled around a flight timetable display). Is the space retail? Are the stairs an escalator, or are they static? The use of promotional material at POS and Out of Door tends to be either a five second informational burst based on your users journey times or a series of images and information pieces subject to differing parallax treatments. The best examples I´ve seen are the way that advertisers use the escalator speed at London Underground stations to build a narrative. Not the answer you're looking for? Browse other questions tagged user-behavior physical placement displays or ask your own question. Solutions for dealing with really bad user entering wrong data? Is duping the consumer really a good business practice? Why do electric fan knobs often place the highest setting right after the off position? Why do public restrooms place the paper holders so low? Where should I place the leaderboard ad? What's the best thing to do after an unsubscribe link was clicked? Why is the R in front of the D gear in cars (and vice versa)? Is it OK to use multiple indications which depicts the same thing?